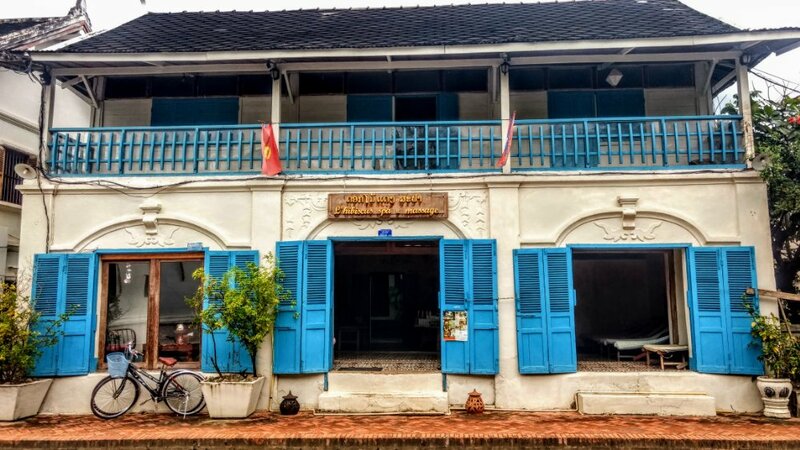 Luang Prabang was our first proper Laos stop after our two day slow boat down the Mekong seeing mud hut villages and staying in small riverside towns. It was nice to be back on firm ground again and we were looking forward to seeing what Laos’ second biggest city had to offer us. We arrived hungry and thankfully Luang Prabang has a pretty spectacular night market. The food portion of the market is down an alleyway just off the main thoroughfare and here we found a plethora of BBQ stalls and vegetarian buffets. Oh yes please! All the vegetables you can fill into a bowl and some BBQ Laos sausage – delish. 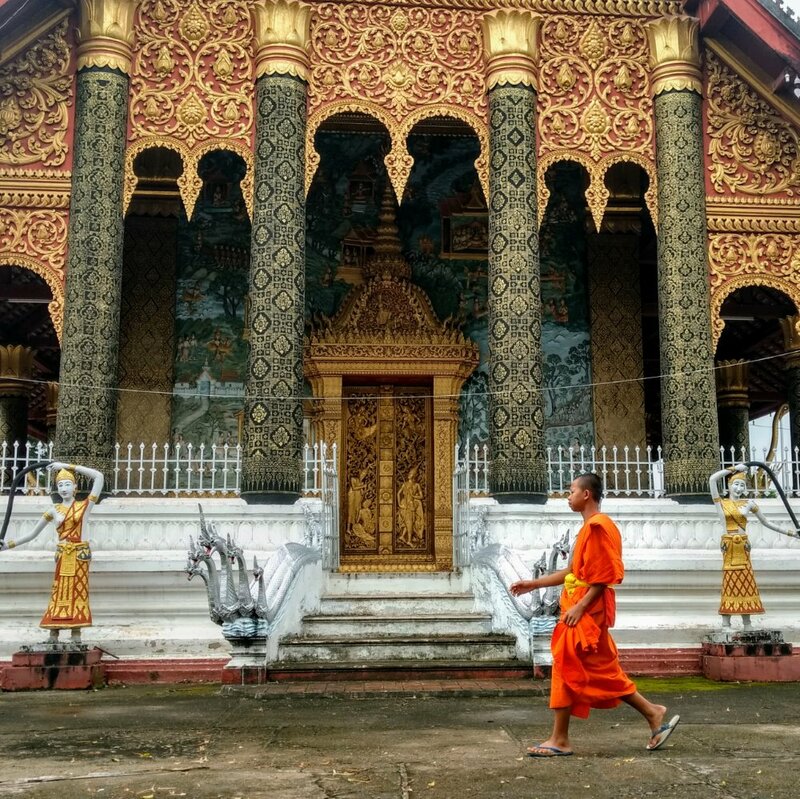 The first full day we spent walking around Luang Prabang visiting temples and the former palace. These were lavishly decorated with an abundance of Buddhas, but nothing that we hadn’t already seen after 6 months in Asia. However, the local architecture was nice and it is a nice town to stroll around. The next two days we spent exploring outside of the city. 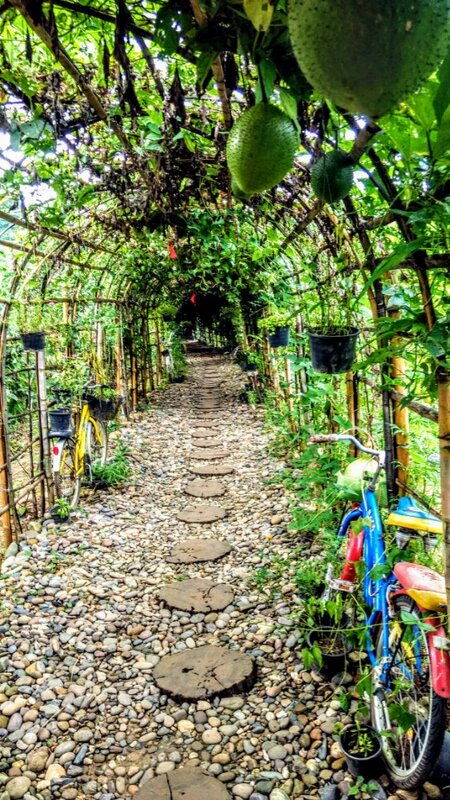 For the first day we hired bicycles to visit Nahm Dong Park which was just 10km away. We opted for road bikes as opposed to mountain bikes. The bike shop man looked a bit shocked at this choice but it had been so long since we had ridden on a decent road bike and why would we need mountain bikes on the road?! How wrong we were! It seems as though the Laotians take the end of Back to the Future movie when Doc Brown says “Roads?! Where we’re going we don’t need roads” to heart as outside of the city, no matter which way you go, at some point the road will just turn into a dirt path of varying condition. Unfortunately for us the road to Nahm Dong Park turned into a dirt path pretty soon on our journey and more unfortunately for us our destination was at the top of a mountain! This led to a fun and sweaty ride passing small countryside villages where the kids watched in disbelief at us silly foreigners trying to get up this mountain, on a road this bad using a road bike. But we got there and it was worth it. Nahm Dong Park isn’t in many tourist books so it was quiet which meant we had the whole multi-leveled waterfall all to ourselves for most the time we were there. The place also had a 10 minute walk to some caves (not worth it), a lookout platform which did have a good view and a restaurant with seating over the river. This really was a stunning place to visit. The ride back to town we again regretted not having mountain bikes as it was bumpy and slow work. And this time the kids outright laughed at us as we negotiated large troughs and rocks. The next day we ditched the for a moped as we were going a bit further afield. However, this journey wasn’t without its nuances either as just after leaving we entered a huge rainstorm. We were offered shelter in a random persons porch but after 20 minutes of wait we decided to brave it back to the hotel. Thankfully in the afternoon it cleared up and we got on the road again. 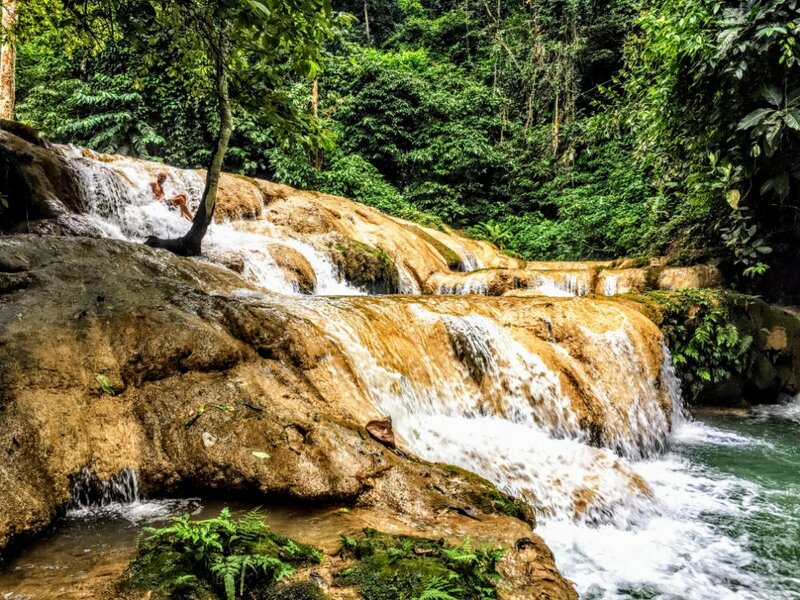 This time we were visiting Kuang Si waterfall. It was a lot more touristy than Nahm Dong but nevertheless it was a pleasant walk to the main waterfall past a sunbear enclosure and a good climb up the top to conquer it. But there were so many people it was impossible to find a nice swimming hole to ourselves. On our last day our early morning bus to Vang Vien was cancelled due to the road being closed, the bus being full or the hotel forgetting to book it for us (pretty sure it was the latter) which meant we got moved to the later pickup. Not wanting to waste time sitting around and waiting we decided to climb Mt Phousi which we hadn’t got around to do due to the bad weather the day before. This was a worthy climb as it provides a great view of the river, the mountains and the town so in the end we were pleased we had to change buses. 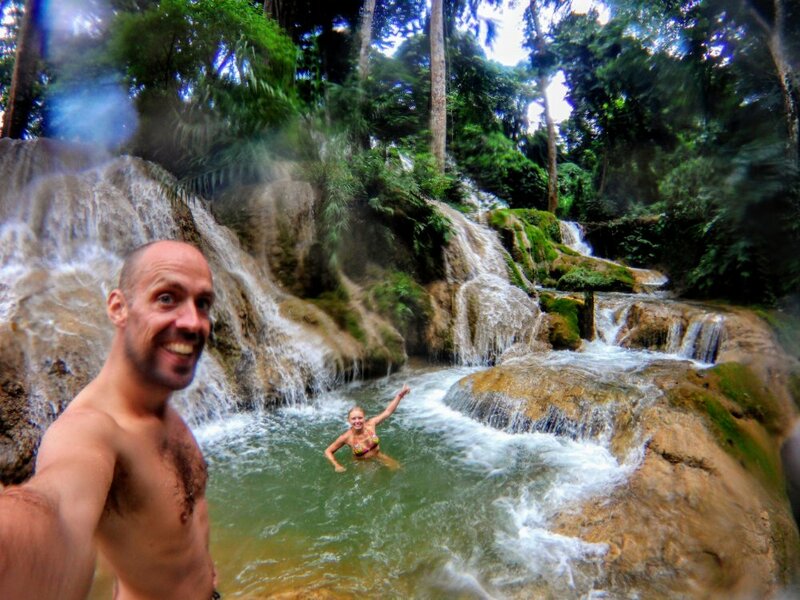 We really enjoyed Luang Prabang. There was a great vibe to the town, plenty to explore and some really high-end tech (see photo below). 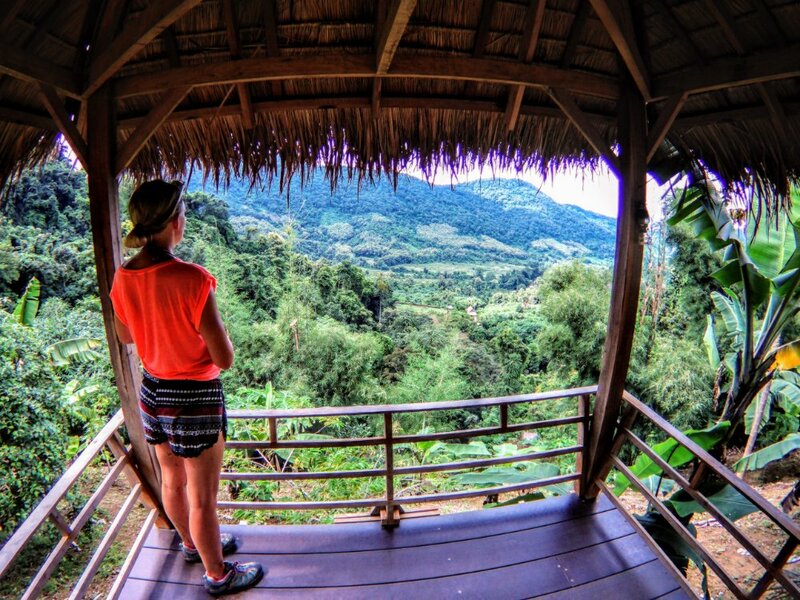 A great start to our time in Laos. Stay: We stayed at Khammany Hostel. It was cheap for a double room and provided an egg breakfast. The room was really damp with the occasional cockroach. It was fine for the money (73,500 LAK / £6.55 / $8.82 a night) and for a few nights. They were about to start renovations so it may change a lot…but I doubt the renovations will change much. Eat/Drink: The night market was great for cheap eats. However, as per any buffet dining experience, the vegetables were a little over cooked and definitely weren’t the freshest. The were a good number of restaurants and bars along Kingkitsarath Road which were cheap and fun. Everyone bangs on about Utopia bar, but we though it was overpriced for what it offered. Do: Nahm Dong Park was our highlight. Not very touristy, a great spot for lunch and a super waterfall. If you are cycling then go for the mountain bike 😉 Mt Phousi is also definitely worth the climb! 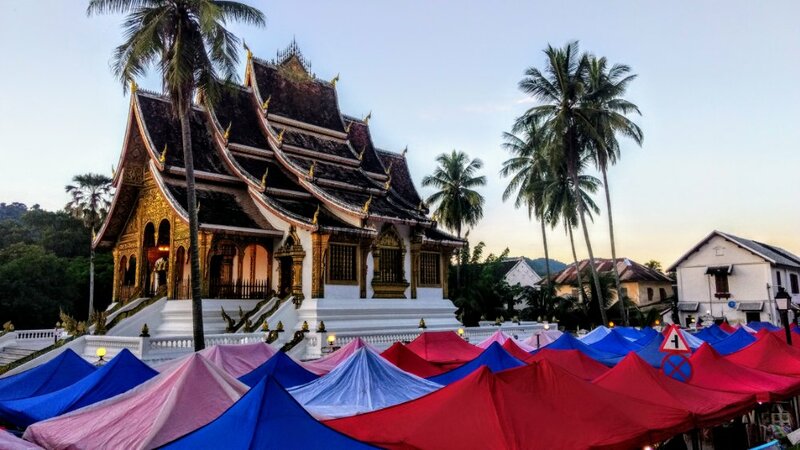 I’ve been to Thailand, Cambodia and Vietnam but never Laos! Anywhere else you’d recommend apart from Luang Prabang and Vang Vien? Thinking of finally heading there in 2018 👌 fingers crossed anyways! Wow, awesome if you get the chance to visit. We only had a few weeks there as had to catch a flight. 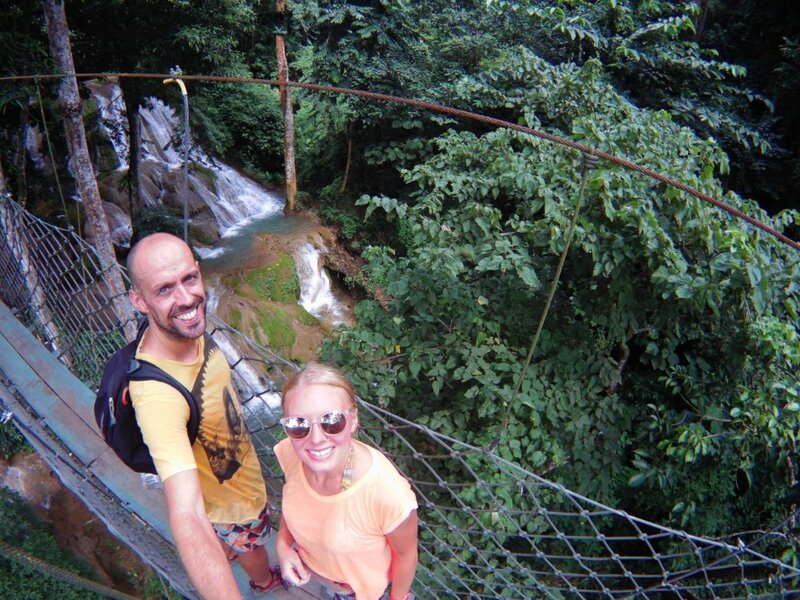 So we only did Luang Prabang, Vang Vieng and Vientiane. Vientiane was great (blog coming soon) and we would recommend as it is a great place to see a different side to Laos. Got our fingers crossed for you. 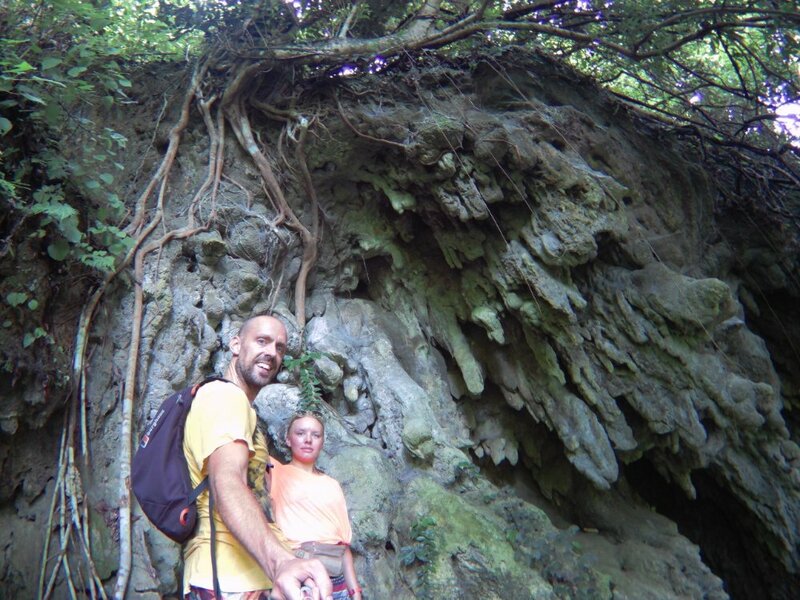 And hopefully one day we will be back to explore more off the beaten track! 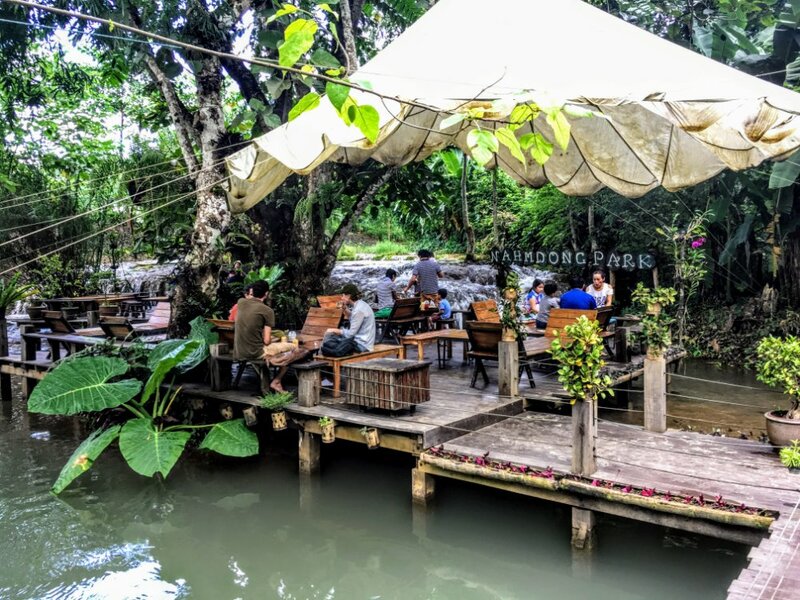 If I go I’ll also spend more time in northern Thailand and Vietnam so those three places in Laos would probably be perfect for the limited timing I have. 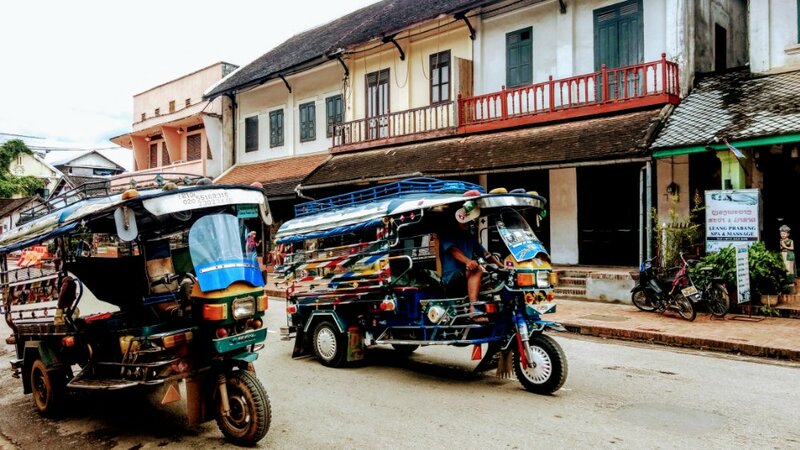 Looking forward to the post on Vientiane! That will be a fantastic trip! Ha ha. We’ve been very lucky indeed. No chance in the backpack though, we are crazily over packed! We’ll have to come up with a better plan. Maybe we can get bigger bags. This brought back great memories for me. 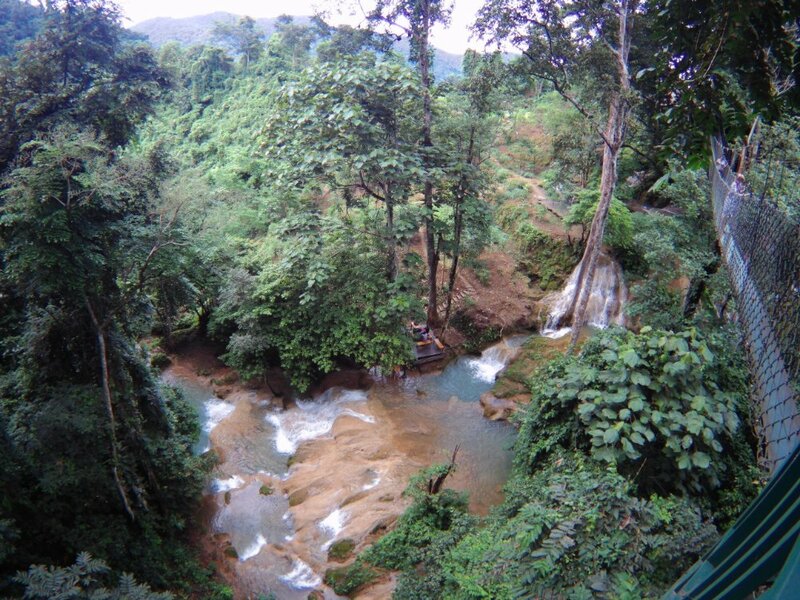 I loved Luang Prabang and the rest of Laos, particularly the villages further north. Great photos. 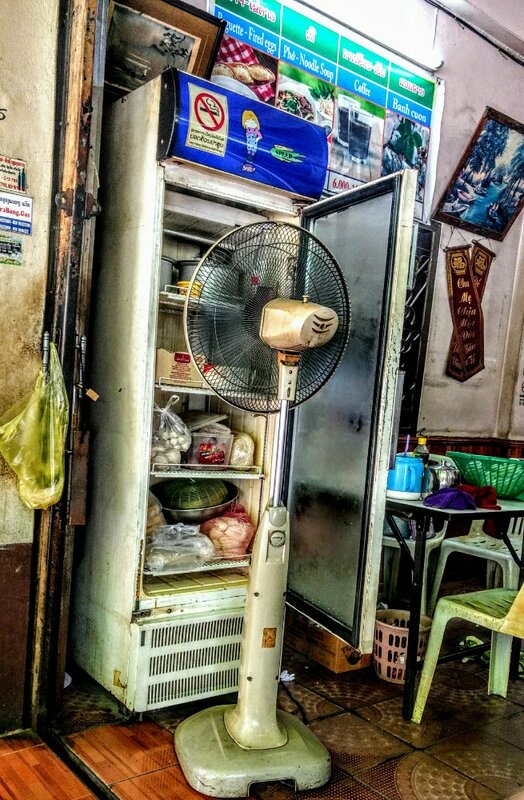 The high tech refrigeration is hysterical. Ha ha. More great adventures! We were traveling south so headed down to Vientiane after (stopping at Vang Vieng first). Still a dangerous mud road but a lot of fun! Yes, a lot of tourists here too now, but there are still quite a few “undiscovered” places if you are willing to cycling or scooter mud tracks and through the villages. Fantastic to hear your story once again – thanks for sharing!